Welcome to the Marine Innovation Southern Australia (MISA) website. MISA brings together South Australia's top aquatic institutions and research scientists to pool our resources and knowledge, and grow our seafood industry more efficiently. MISA, an initiative of the South Australian government established in September 2005, has significantly enlarged research capability to support cutting edge marine research and education. This strong capability has firmly placed South Australia at the forefront of marine science both nationally and internationally. MISA partners are now delivering innovative and practical solutions to SA's seafood producers and processors to help the industry grow in a healthy and environmentally sustainable manner. Seafood industry - represented by the Australian Southern Bluefin Tuna Industry Association; Oyster South Australia (South Australian Oyster Growers Association and South Australian Oyster Research) Council; and Wildcatch Fisheries SA. The World Fisheries Congress 2020 (WFC2020) is being held in Adelaide, South Australia on the 11-15 October 2020. The WFC2020 aims to have a diverse, exciting and broad reaching Congress to showcase the world's commercial, recreational and indigenous fisheries. We would like to invite you to co-create the Congress program and to help set the future directions for the world's fisheries and lead/engage in these critical discussions. If you are interested in leading sessions, symposia or education and training workshops or have ideas/suggestions you wish to share, please e-mail: conference@aomevents.com by 30 November 2018. Find out more on the WFC2020 website. A MISA led initiative provides the first comprehensive understanding of the total contribution the South Australia marine industries make to the economy. In a report prepared by Deloitte Access Economics, the estimated value of production, as well as the economic contribution of each South Australian marine industry, is considered. 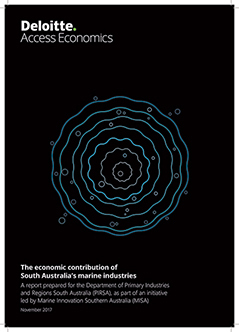 Click here to view 'The economics contribution of South Australia's marine industries' report.